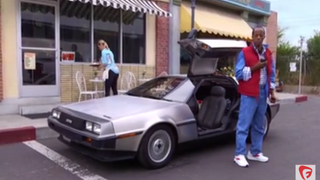 Goldie Wilson travels in time to 2015 in this Back to the Future parody. Today, Oct. 21, 2015, is a big day for fans of the Back to the Future film franchise. It was to this date that Marty McFly, Michael J. Fox’s character in Back to the Future II (1989), traveled forward in time to save the lives of his future children. Today, in the midst of police forces with hover boards, Google patenting a computerized contact lens and smart cars that drive themselves up to 150 mph, much of social media has spent the day digging through exactly what the films got wrong and what they got right about this year. Enter Goldie Wilson, black busboy-turned-mayor in the first BTTF film. As a parody of the film, Fusion’s F-Comedy released a video, “Black to the Future,” that highlights the reality that the more inroads black people make in the United States toward justice and equity, the more this country stays the same. It shows that we can, on the surface, be treated as full human beings and then, in the blink of an eye, be dehumanized in the most violent and oppressive of ways. From being able to enter through the front door of an integrated establishment to watching President Barack Obama address the nation on television, Goldie learns—as so many of our daughters and sons have—that cosmetic diversity isn’t collective uplift, and that even when cloaked in respectability, state-sanctioned violence upon black victims is just as American in 2015 as it was in 1955. Watch the video here and drop your thoughts in the comment section.